In response to the rising concerns of infection and cross contamination Hy-Tape has delivered single use tape rolls and cold pack pre-cut strips. Hospitals, clinics, and care facilities have had to seek new methods of reducing the chances of cross-contamination. One of those methods is shifting to single use tape rolls. By eliminating shared rolls, the chances of infection decrease. 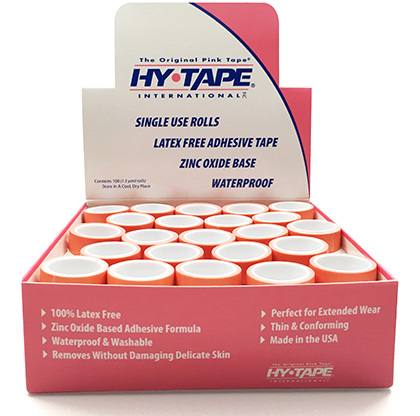 Hy-Tape has responded by offering Single Use Tape Rolls. We understand than there will always be demand for a latex free tape with all of the unique qualities that make Hy-Tape the most desired specialty tape on the market. The single use Hy-Tape Kit Rolls come in either .5” or 1” and have 1.5 yards per roll. Each box contains 100 rolls of tape. Now nurses and caregivers can dedicated a roll of tape to a single patient without wasting tape. We also offer Hy-Tape Strips; a 1.25” x 6” pre-cut, single use tape strip to expedite any taping application. The strips come in packs of 4 and have all the unique qualities that nurses, patients and caregivers have come to love. This single use option is faster and easier to use, patients can quickly secure their devices, picture frame wounds or ostomys without the need to tear from a roll or use scissors.